In 2006, Richard Gwyn was given a year to live unless a suitable liver donor were found. A novelist and poet, he lost nine years of his life to vagrancy and alcoholism in the Mediterranean, principally Spain and Crete. This memoir is an account of his "lost" years; of addiction and reckless travel; serial hospitalizations; redemption via friendship, imagination, intellect, love and fatherhood; recovery; living under sentence of death, and the life-saving gift of a hepatic graft. Start reading The Vagabond's Breakfast on your Kindle in under a minute. An enthralling memoir of a young man going deeply and terribly astray. --Tessa Hadley in the London Review of Books. Richard Gwyn is a novelist, poet and critic. A brief incarnation as a beat poet in the late Seventies culminated in an appearance as a support act to The Cure. He also worked as an inadvertently fraudulent milkman and (legitimate) sawyer in London until an industrial accident led to voluntary exile from Thatcherism and nine years of vagrancy in the Mediterranean. His publications include The Colour of a Dog Running Away, published in the UK, USA and in many translations, and Deep Hanging Out, both novels; two academic titles on illness, the body, and communication, and several poetry titles, the most recent being Sad Giraffe Cafe. He is Director of the MA in the Teaching and Practice of Creative Writing at Cardiff University, and lives in the city with his wife and two daughters. I liked this book very much in spite of my usual reluctance to read about addiction, alcoholism and living rough (I have a long-running fear of being an old lady wheeling a supermarket trolley round filled with old newspapers for my bedding). Richard Gwyn is extremely talented; he could have been a composer but instead became a writer/academic. His beautifully-written memoir opens with him waiting for a liver transplant as a result of hepatitis and ends with the realisation that, having had his transplant, he has to step tentatively back in the kingdom of the well. In between he briefly covers his school days and then in some detail his period of vagabondage but he writes about so much more than himself. He discusses the writers he loves, the meaning (if any) of coincidence/synchronicity, the juxtaposition of fiction and reality, and the nature of illness. His writing on insomnia was so powerful I lay awake one night feeling utterly terrified that I was going to become an insomniac as he was at that time. I would have been interested to read more of his thoughts about the nature of his addiction but perhaps I just have to accept that he regarded his "embrace of drunkenness and aimless wandering as an intellectual or even spiritual endeavour". I was going to say it was the best book that I'd read this year, *and* that it was a simply fantastic book, but I see that two reviewers got there ahead of me. Both sentiments are true, however. Deep, dark and truthful, an utterly compelling account of one man's journey into the arena of the (seriously) unwell and back again, driven by his addiction to both alcohol and the journey as spiritual quest. Dense with ideas, yet written with the lightest touch, I can't recommend it too highly. I've never quite felt compelled to leave a review on Amazon before, but if my meagre contribution convinces even one person to read this book, I would be very happy indeed. 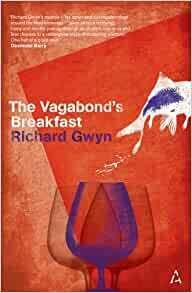 It has been a while since I last read The Vagabond's Breakfast, but the impression it left is just as sharp, and it's influence undiminished. As somebody who has always been enchanted by the freedom and infinite possibility of just wandering with no destination as such, this book satiated my expectation and far surpassed it. This is book about so much more than merely wandering; in fact, it touches upon quite profound understandings of time, memory and identity, as well as discussing literature in ways that were hitherto unknown to me. The Vagabond's breakfast introduced me to Borges, as it happens. I recommend this book heartily to all. 5.0 out of 5 starsWhat a great find, a rare treat - a brilliant book! This is a fantastic book. I found it by complete chance in a second hand book shop, in the new section - there was something that I found intreging by the description on the back - a life lived on the road to excess and the consequences that played out in adulthood, but it's much more than that. The author has an eye for a detail, so much so that you feel you have lived his journeys with him, you are there in Crete, in Barcelona. It is gripping as much as it is haunting, and I wasn't able to put the book down. I can't recommend it highly enough.